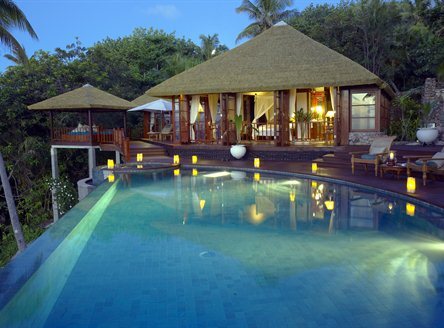 Voted 'Indian Ocean Leading Private Island Resort' at the 2015 World Travel Awards. 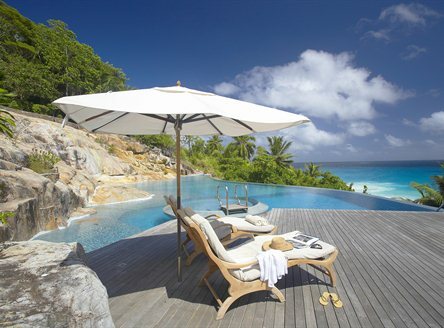 Fregate Island Private offers a unique island experience... exotic, exclusive and isolated! 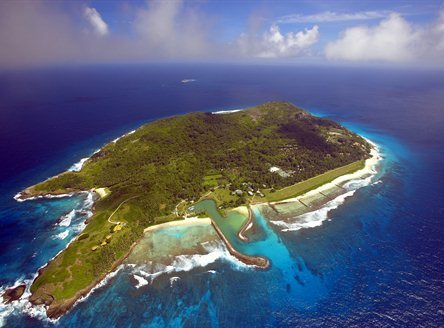 Words fail to describe this incredible island, only 20 minutes by helicopter from Mahé. The French explorer Lazare Picault, who discovered the island in 1744, was so impressed by the flying abilities of the local fregate bird that he named the island after them. Over 250 years later, Fregate is truly a 'unique island experience'. 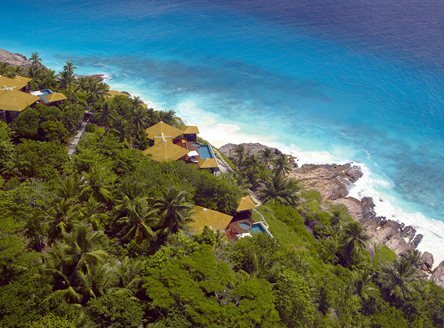 Standing on a granite Glacis on the northern side of the Seychelles archipelago, Fregate Island has an architectural style combining design influences from the Seychellois as well as Bali and Thailand. 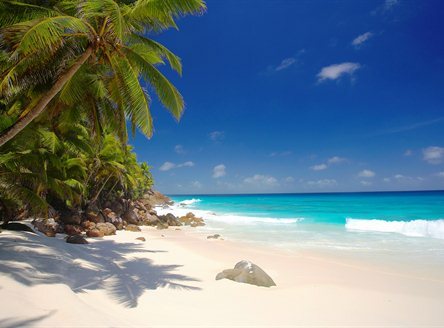 In the 19th Century, a British Governor once described the location of the Seychelles as being "a thousand miles away from the rest of the world". 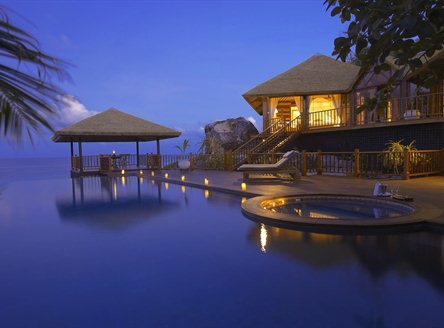 Today, guests staying on Fregate Island Private have the feeling they are worlds away from mass tourism and the daily stress of their hectic lifestyles. The 16 exclusively designed villas, all arranged to offer privacy, nestle harmoniously into their surroundings; 14 overlook the ocean and beaches, while 2 have a sheltered grassy position, ideal for families with children. 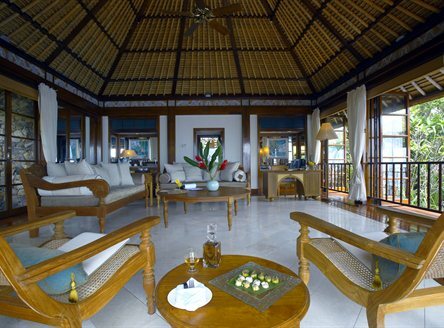 Upgraded in 2014, all villas are richly furnished in Thai silks and Egyptian cotton; each has a glass-enclosed entrance foyer, separate living room and bedroom, and two bathrooms with outdoor showers. 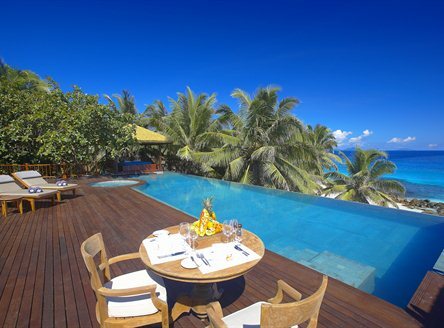 A wooden sun deck leads to a private pool with jacuzzi, as well as a sala with day-bed and separate dining pavilion - a picture-perfect setting ideal for in-villa dining. 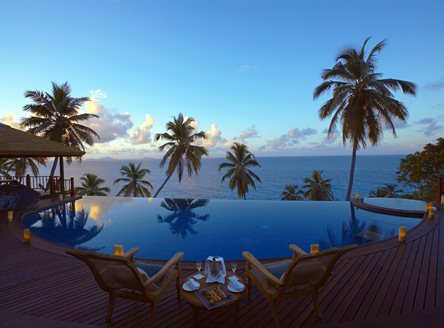 You also have the possibility to dine 'anywhere, anytime' on Fregate Island Private... in the tree house, in the banana grove, on the beach or at any other location on the island. A private butler takes care of your every need. The main building - Fregate House - has one of the islands two à la carte restaurants (both supplied by the island's own plantation) and offers a daily gourmet menu; there's also a library and an exclusive boutique and gallery. The Plantation House serves authentic Creole à la carte cuisine - a wonderful venue for open-air dining. The Pirates Bar & Anse Bambous Beach Bar also offer an excellent selection of light snacks. There are two infinity swimming pools spilling over into waterfalls cascading down the rocks. The water sports programme is far-reaching, and the island even has its own marina with an entire fleet of sailing craft, as well as deep sea fishing vessels and a PADI dive centre. The island has operated a highly successful Fregate conservation programme in which guests are encouraged to participate. For example, the island's 'adopt a tortoise' programme is focussed on saving juvenile Aldabra Giant Tortoises, and a contribution of 100 Euros helps towards this as well as other endangered species, including the island's mascot - the Seychelles Magpie Robin. In the waters around Fregate Island, it is not uncommon for divers to encounter whale shark and dolphins during the diving season. 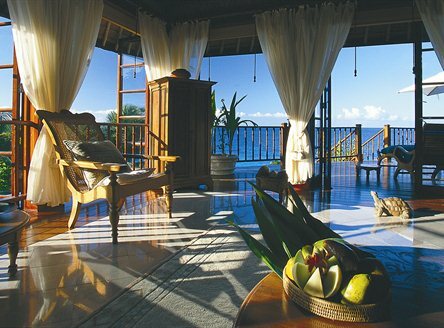 Fregate is an island for individuals seeking privacy and tranquility. 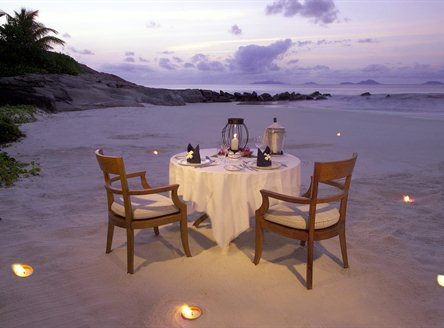 Its 3km² offers seven dream beaches, crystal clear waters, as well as flora and fauna unparalleled in the world. Despite the island's relative proximity to the main island of Mahé, just 60kms away, only a few tourists find their way to this small, private paradise! 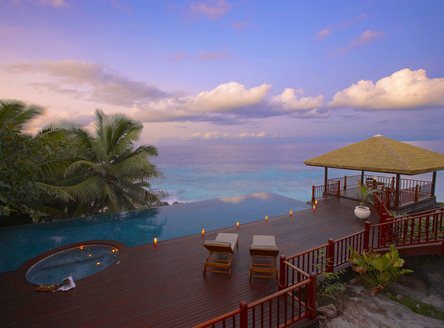 Read more about Fregate Island. Helicopter from Mahé - approx. 20 minutes. 16 air-conditioned villas (13 one-bedroom villas and 3 two-bedroom) all with ceiling fans, bath, one indoor and two outdoor showers, separate living room, TV, CD/DVD player, wifi internet access, mini-bar, wine chiller, private infinity pool, Jacuzzi and terrace with day-bed and private dining pavilion. 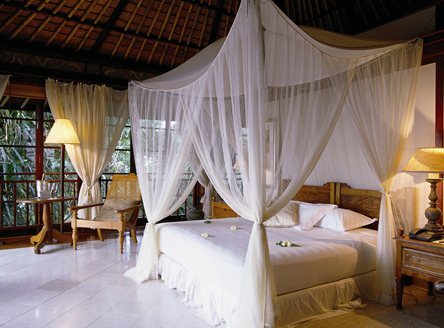 A Presidential Villa sleeping up to 6 adults or 6 adults and 3 children, can also be arranged. Details and prices available from our knowledgeable team. 7 nights from £15,599 per person on Full Board in a Villa. This price includes private helicopter transfers from/to Mahé. 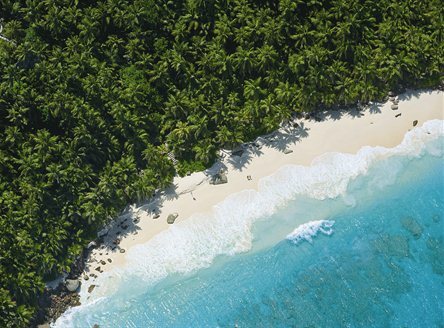 Bookings made at least 3 months prior to arrival and for a minimum of 6 nights, can receive a complimentary one-way helicopter transfer from Mahé to Fregate. Valid for stays: please call for latest offer dates. Free transfer is for maximum 4 guests per booked villa. Maximum payload capacity: 325kg per flight including passengers & luggage. Combinable with other offers. 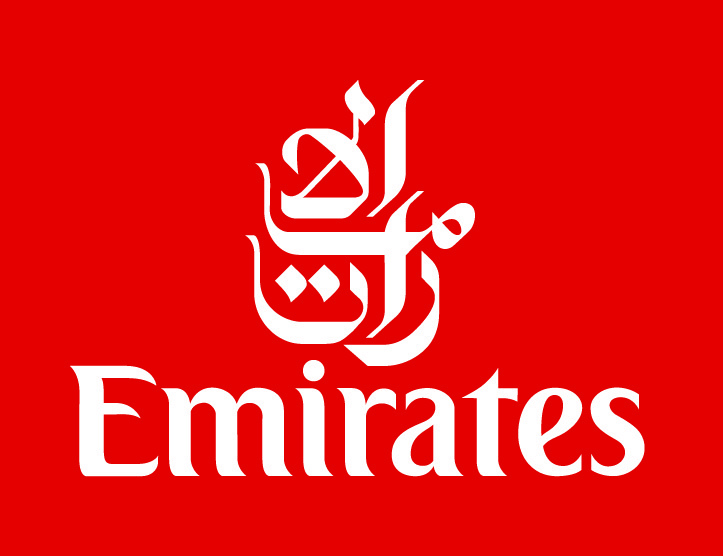 Free Night deals include Stay 6 Nights, Pay 5 and Stay 12, Pay 10. Please call us for a tailored quotation. Two children under the age of 11 years stay free when sharing parents villa. Plus, up to 2 hours free babysitting service each day. Please call for offer validity dates. Minimum stay 7 nights. 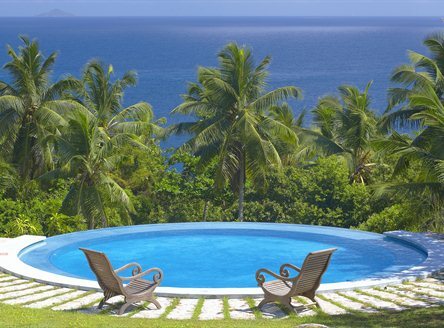 Valid in Private Pool Twin Residence & Private Pool Residence. Combinable with other offers. Valid: all year. Minimum stay: 7 nights. Combinable with all other offers. Clients marrying on Fregate will benefit from a range of luxury 'treats' including: romantic candlelit dinner on the beach; complimentary spa treatments; romantic sunset cruise; a complimentary wedding cake...... and much more! Please call for validity dates. 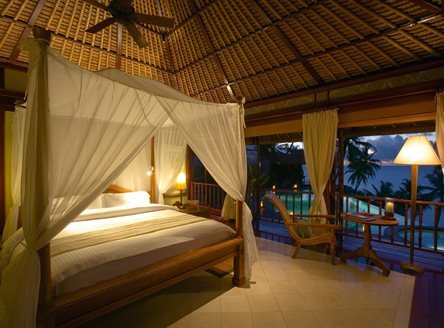 Combinable with free night offer and one-way helicopter transfer. Minimum stay: 5 nights. Please call for more details and a quotation. 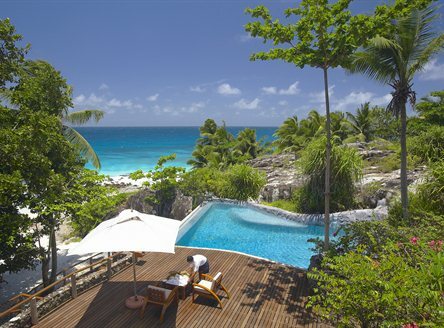 One of the most beautiful islands in the Seychelles, if not the world! 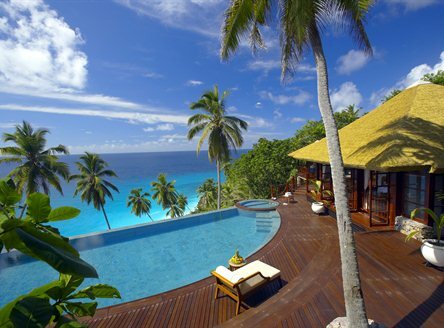 A luxury eco-experience where privacy and tranquillity is assured. 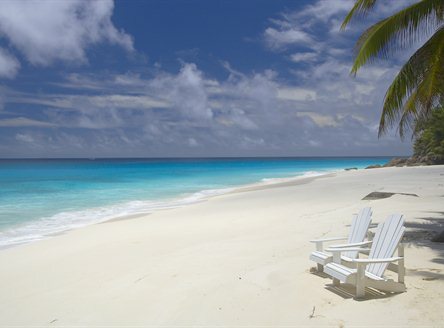 "For privacy and seclusion on your own white sand beach, flip over the sign at Anse Macquereau beach to 'Occupied' and no one will disturb you! And, if you need a cooling drink, just call your butler from the phone beside the beach and it will be with you in no time! However, there's much more that Fregate offers. For example, take a guided nature walk with the Island's Ecology Manager and discover a wealth of unique fauna and flora."